Free Book from Nese Ellyson!!! Nese and I met online years ago when we’d both entered a Harlequin contest. Neither of us won, but we’ve kept in touch and have become good friends. Today and tomorrow, her inspirational romantic suspense, Escape to Sanctuary, is Free. This is an exceptional story of love and bravery in the midst of being hunted by a serial killer. It’s a page turner you won’t want to miss. An excellent time to grab your copy. When Dr. Evangeline Tourmaine’s step-mother turns up dead, she comes back to the states and unwittingly becomes the target of a killer. FBI Agent Colton Segar swears he will protect Evie, if it’s the last thing he does. Not easy to do when she keeps saving people in need of medical help. She’s drawing a lot of attention. As Colton tries to keep her under the radar, he finds himself drawn to her, and soon protecting her is more than just his job. It becomes a matter of heart. “My husband, Rafael, he has the fever for three days. He is sick with the vomit like color of leaves, and has plenty of pain. I am afraid for him,” said the woman Evie knew as Aaliyah. “Take me to him.” Evangeline Tourmaine, Evie to her friends, grabbed her satchel and followed the woman as she rushed through the village. They entered a hut at the edge of town, one in much better shape than most others around it, and the interior was clean, almost as clean as the clinic’s hut she worked out of in the center of the village. “Yes,” said the man between harsh, labored breaths. “Where does it hurt?” she asked as she pulled on a pair of disposable latex gloves. He put his hand over his right side above his hip. She gently pressed around the area. Rafael screamed in pain. Not good. She checked his vitals. Temperature 103; Blood Pressure 135/90. Evie had expected the elevated BP because of the pain the man was in. She suspected his appendix was about to rupture and if it did, the poison would go all through him and that would mean certain death in these primitive conditions. Which meant immediate surgery, but there was no way to get him to the clinic, even if there was time. For an answer, he nodded, still gasping for breath due to the pain. “Rafael, it’s your appendix,” she informed him a few minutes later. “It has to come out before it bursts,” she said as she removed the soiled gloves and put on a fresh pair. “Okay, Doctor. Just please, stop the pain,” he pleaded. “I think so.” Aaliyah helped her husband to a sitting position. She prepared the needle and swiped his skin with an alcohol swab. “This may be uncomfortable, but try not to move.” She injected the medication. “You can lie down again now,” she said as she prepared her instruments for the operation. Thankfully, they were already sterilized and wrapped. She had a thermal blanket in her bag. It was waterproof and she took it out to slide it under Rafael to protect the bed. Not an easy task, but with Aaliyah’s help, they got it in place. “I can’t feel my legs,” Rafael complained. He nodded off almost immediately and Evie began the task of removing the appendix without it rupturing. In this heat and in less than sterile conditions, Evie prayed for guidance and a successful operation. Three and a half hours later, the operation a success and the patient bandaged, Evie was finished except for the clean up. She’d had to stop once to tie a bandanna around her forehead as the heat of midday intruded. She removed it now. It was soaked, but it had served its purpose. “You go home, Doctor Evie. I clean up,” said Aaliyah. “Are you sure?” Aaliyah sometimes volunteered at the clinic, so she knew to keep her home as sterile as it could be, given a dirt floor. “Thank you, Aaliyah. I am tired.” Tired? She was exhausted. Evie wiped off her instruments and put them back in her bag ready to sterilize them when she got back to the clinic. She hugged the other woman and left, walking back through the village a lot slower than when she’d gone with Aaliyah. She heard an infant crying and headed in that direction to find the child quieted now that she was feeding. Evie nodded and smiled at the mother, then resumed her trek to the clinic. She smiled as she came across some children playing tag. If only she had their energy. She pushed back the curtain and entered the clinic, proud of what she’d accomplished here in this village. It was nothing more than a straw and clay hut like the natives lived in, only bigger, with white curtains dividing the inside area into cubicles of a sort. People came from miles around to see the lady doctor. Home…thousands of miles away…just what she didn’t need at the end of a long, stress-filled day. What did her stepmother want now? Ever since her father died, the woman seemed to think Evie had to cater to her. It wasn’t enough that she’d arranged a quarterly income from the estate for the woman, she constantly had her hand out for extras. And the pleading had gotten worse since she’d remarried. Apparently, her new husband couldn’t afford to keep her in style. In no particular hurry to talk to the woman, Evie checked on a couple of her patients and grabbed a coffee and a snack from the kitchen area before going to the office. She sat behind the desk and heaved a tired sigh as she picked up the message slip. It wasn’t from her stepmother. A lawyer’s office she’d never heard of had called to say there’d been a death in the family. She was to call for details. The news took her by surprise. They had to be referring to her stepmother. She was the only ‘family’ Evie had left. Evie felt a brief pang of guilt for her less than complimentary thoughts about her stepmother, but there was no love lost between them. They’d barely tolerated each other. Might as well get it over with. She picked up the phone and dialed the number written on the paper. She’d have to go home for the funeral and settle the estate. What on earth could she do with the Fairlawn Estate? Yes, she’d lived there growing up, but it was an historic mansion full of antiquities and never had felt like home, not that she’d had anything to compare it to at the time. She was put through to an answering machine. It let her know that no one was in the office and to leave a number. “This is Dr. Evangeline Tourmaine. Your office called to inform me of a death in the family. I will be enroute to America as soon as I can arrange a replacement and should be in Ohio by weeks end. I’ll be in touch when I arrive as I will not be available for you to contact me.” She hung up not really knowing if she should have given them any more information. Due to the circumstances, she was able to find a replacement fairly quickly, but still, it was almost three days later when she’d boarded the plane. Eighteen hours in the air and two plane changes later, she was home. Or close to it. She hadn’t slept a wink on the plane due to an elderly gentleman snoring beside her, so her first stop was the airport hotel. She’d get a good night’s sleep and rent a vehicle in the morning to drive the rest of the way. It didn’t happen as planned. Evie woke through the night, soaked with sweat from a raging fever. When she got up to get her thermometer and a couple of pain meds for the headache forming, she ended up running to the bathroom and hugging the toilet bowl for the next half hour. When she was able, she grabbed a cold washcloth and the small garbage can and went back to bed. Morning didn’t bring with it any miracles. She was back to hugging the bowl again. As a doctor, she realized that she’d been hit with a flu virus. She knew she had to replace the fluids she’d upchucked, but the room had nothing except water, which had promptly set off the retching again. The front desk called at one point to remind her of check out time. Evie took the opportunity to inform them she was sick and had to stay a few more days and requested juice, tea, and toast be sent up. Although she loved her coffee in the morning, just the thought of it made her stomach churn. Three days later, her fever broke and the retching stopped. On the fourth morning, she was able to stand without the room spinning. She ordered a light breakfast and grabbed a much-needed shower. Her stepmother had been buried by then and, as there was now no rush to get home, she allowed herself two more days of rest. By then, she felt recovered enough to continue her journey, so she rented a car, checked out of the hotel, and headed out. She’d only gotten about thirty miles down the highway when her weakened condition had her seeing double and she checked into the next motel she saw. The next few days were spent alternately resting and building up her stamina. Full meals helped. It was a country motel and the meals were hearty and nourishing. Still weak from the ordeal and resigned to the task ahead of her, she drove home. The Fairlawn Estate was just as she’d left it years ago. The grounds were professionally groomed and the stone façade gleamed from a recent storm, or at least, that was her guess. She sat in the car taking in her surroundings and knew she wouldn’t be staying in that big, empty mausoleum of a house, so she turned around and headed back to town. She’d drop in on the lawyer and then decide where to go and what to do. An hour later, dazed and confused, Evie returned to Fairlawn. The lawyer was wrong. She didn’t know where he’d gotten the phony will, but Sheriff Caine was not the new owner of Fairlawn. The estate was hers and had been for years. Her grandfather had entrusted the estate to her on his death and no conman sheriff or his thieving lawyer was going to yank it out from under her. Even if she didn’t want to live in it, it was still her family’s property and she was the only one left. It was up to her to decide what to do with the estate. She walked around the grounds, through the formal gardens, bypassed the gazebo, and ended up at the boathouse. It had always been a special spot for her and she’d spent a lot of time there as a child. If she wasn’t reading or writing a story, she was swimming in the lake. Evie went inside and opened the big door to the bright, sunshiny day, a distinct contrast to her current mood, and sat on the sill looking out over the water. The gentle ebb and flow of the lake in front of her calmed her enough to realize that she needed to call her lawyer. Soft hold music sounded in her ear and she became conscious of footsteps behind her. Someone had entered the boathouse. Evie turned toward the sound and a man in police uniform stood beside a giant of a man who had a gun pointed at her. “Well, now, who have we here? Looks like a trespasser to me. Wouldn’t you say so, Miguel?” said the officer. Evie didn’t wait to hear any more. Fear shot her adrenalin sky high and she quickly ducked behind the skiff, pulled down the wench, sent the gear falling from the rafters, and took off running along the lake. The gunman got off a wild shot while everything was falling on him. She felt the burn as the bullet entered her shoulder, but there was no time to waste. Evie made it back to her rental car and took off, spinning a volley of gravel stones at the two men now running behind her. She knew they could easily track the car, so she pulled into a seldom-used side road at the edge of town and parked. She walked back through the woods, leaving the car abandoned at the side of the road. All she carried was her backpack, which held her doctor’s bag, toiletries, wallet, and a change of clothes. She’d have to get to a phone and call her lawyer as she’d lost her disposable cell when she ran. She also had to call the rental company and tell them where to pick up their car. But right now, she needed to stay alive and figure things out. The walk through the woods was peaceful and quiet but it was getting darker by the minute. Once she’d gone about as far as her tired body would allow, she happened upon a shed in a clearing. She wondered who had built it and why it was there in the middle of nowhere. Then she spotted the charred remains of someone’s house long since abandoned. She turned toward the shed and slowly pulled the door open, hoping nothing hid inside waiting to attack. Nothing scurried or slithered about, so she batted a few cobwebs away and looked inside the darkened interior. She could barely see an old car seat, which sat along the opposite wall. It would have to do. She closed the door and fumbled her way to the bench seat in the dark. She needed to rest for a moment. If she could just catch her breath. Who was after her? Her mind raced at all the possibilities. This wasn’t how her return stateside was supposed to happen. She was so exhausted. She needed to find some place safe, but where? An officer had been with the man shooting at her. An officer the man referred to as sheriff. The same one trying to cheat her out of her home? How many other men were on his payroll? Darn it all! If she couldn’t trust the police, then who? Evangeline slumped to a prone position. She was so tired and confused…and angry that someone would try to kill her. That had to be Sheriff Caine with that man at the boathouse. He’d acted as if he owned the place. The shock started to wear off and the searing pain from the gunshot wound throbbed. She couldn’t stop herself from sobbing due to the fear and pain. She must have slept. When next she awoke, it was morning. The dull gray of a rainy dawn filtered through the one grimy window. Rain thundered on the tin roof, but the shed had kept her dry. She stood, her body stiff and sore from sleeping in such a cramped space, but she had to keep moving. She’d soon have to tend to the gunshot wound before it got infected. She had already lost a lot of blood and was fast losing what little strength she’d regained since her bout with the flu. And she was hungry. She’d had nothing to eat since breakfast at the motel the day before. Plodding along on tired feet in wet shoes was not her idea of a good time. Her hood was up but rivulets of water ran down inside the front. She could barely see two feet in front of her – it rained that hard at times. She had to find a place, a washroom or something, where she could remove the bullet and bandage the wound. Tap water had to be better than lake water for cleansing the injury. She’d made it to town but didn’t dare walk down the street or stop at a restaurant. Evangeline stayed in the shadows as much as possible. With the heavy rain, not too many people were out and about, but she doubted that her attackers had quit looking for her. They were out there waiting to pounce. Of that, she was certain. She had to find somewhere safe to stay…to hide out…to rest, until she could figure out what the sheriff and his lawyers were up to. When she glanced up to get her bearings, the word Sanctuary stood out, loud and clear, the lighted sign beckoning from the side of a building just ahead. End of teaser excerpt. Ready for more? Denise Ellyson, aka Nese, lives in a small town in rural Ohio with her own Prince Charming, two boys, and a cat they rescued. She’s an avid fan of romance, particularly when it has a suspense element. She’s always brimming with ideas and loves getting her thoughts down on paper. The day Denise released her first novel, Escape to Sanctuary, an inspirational romantic suspense, was one of the most exciting days of her life. Denise is a bit of a Mrs. Fix It and enjoys doing repairs and renovations on her family home. She enjoys art and her paintings have been in several art shows. She feels she has the greatest job of all, working for her Christian ministry as an artist and designer. Christmas is almost here. I love this time of year. Spending time with family and friends and giving to them as well. I’m just glad I’m still here to see another holiday. For a while there, it was kind of iffy. Cancer is a strange thing, for sure. I beat it, and according to what Mom’s nurse said this morning, she will, too. That makes me very, very happy, as her doctor basically sent her home to die. But she’s coming around. That is my wish this season…my Christmas miracle per se. The doctor had only given her 2-4 months. That was in August. Well, Mom is still here and getting stronger every day, plus the tumor is shrinking. It was the size of a grapefruit when they sent her home, and now the nurse has a difficult time to find it. Praise God! I think by now you’ve noticed that I started a Christmas giveaway back in October with Blessed Homecoming. Many of you have taken advantage of the free books I’ve been offering, and I’m glad you have. You don’t get much in this life for free, so enjoy the books with my blessing. Battered and scarred, no longer the beautiful social butterfly she had been, Victoria Brennan returns home to heal. Physically, emotionally, and spiritually. Unable to bear the pitying glances bestowed on her by the townsfolk, she’s in danger of becoming aloof and withdrawn…until she meets her new neighbor. Noah Jenson, medically discharged from his duty, wants to be away from prying eyes. When he comes upon Victoria on his property, he is outraged. Yet, when her mugger from the city follows her home, he finds himself drawn to her, taking on the role of her protector. But he is no Prince Charming, certainly not with his new prosthesis. The physical pain and emotional adjustments are pushing them apart, but where there’s attraction, there’s always a hope for love. If you have the time, all I ask is that you post a review of my book(s) after reading it/them. I love to get the feedback of your thoughts and feelings, plus it might just prompt someone else to buy and read my work long after the free run. And just in case I don’t get back to you before Christmas, I hope you have the merriest Christmas of all filled with good health, happy memories, and the richest of blessings. #FREE eBook…Love on the Rocks! The Rocks at Hopewell Cape are about a forty-five minute drive from my house. It’s a beautiful spot to catch at low tide. You can walk down the cliff face with the aid of stairs and stroll the beach at your leisure. My kids always loved to explore the caves and run in and out and around the rock formations formed by the high tides. I haven’t been there in the past few years due to health reasons, but it’s a special place. I love it and hope to be able to make the trip next year. When Sara attempts to save her infant daughter, she may also be escaping a fate worse than an abusive boyfriend…she may be running away from true love. The big question is: Which man will find her first? I hope you enjoy Love on the Rocks. Download it with my blessing. And if you have the time, Please leave your review on Amazon. Thank you. Fatima Leone is out searching for the perfect Christmas Tree when her car skids off the road. When she wakes up, virtually in her ex-boyfriend’s arms, she has to wonder if fate is playing tricks on her. All Colin Reyes wanted for Christmas was to be left alone, but when Fatima reappears in his life, he finds himself rethinking his Christmas wish. His Christmas Wish is free today and tomorrow. Download a copy while you can. Available on Amazon. His Christmas Wish is also available in print…large print. 🙂 Only $6.00 US on Amazon. 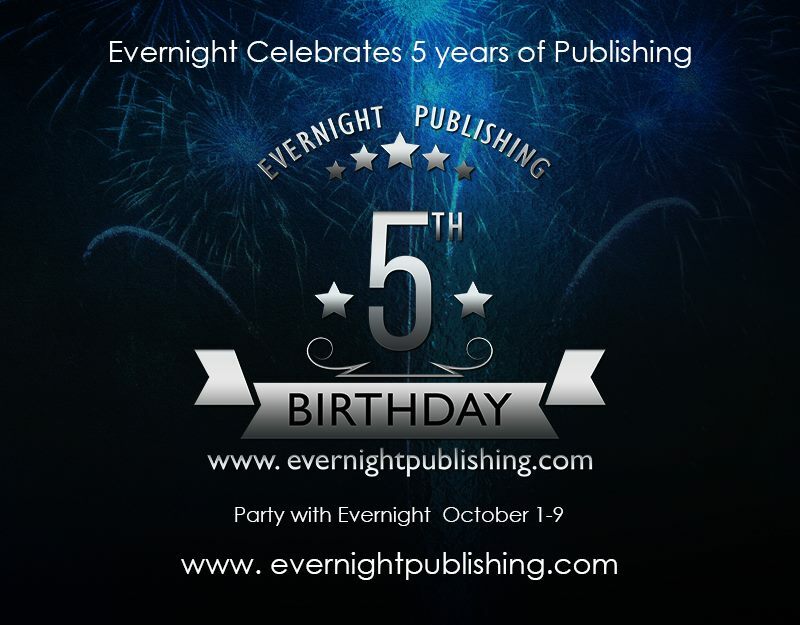 Help Evernight Celebrate 5 Years of Publishing! Apple Watch Sport | NEW Kindle Paperwhite | Fitbit Flex | Evernight, Amazon, and ARe Gift Certificates! Plus – Amazon and Evernight GC galore! BONUS ENTRIES: Be sure to comment at EVERY stop! The more comments you post, the more entries you will receive for our GRAND PRIZES (limit one bonus comment entry per stop). Enter to WIN the Grand Prizes using Rafflecopter. I’m happy to say that I’ve been with Evernight for 4 years now. My debut novel was Zakia and the Cowboy, Book 1 in my Thunder Creek Ranch series. It released on October 6th, 2011, and became an ARe bestseller. My most recent release is Kidnapped: The Search for Casey, Book 7 in my Thunder Creek Ranch series. 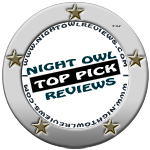 And remember, all Evernight titles are 25% off at ARe from today through October 9th.